This above photo is the standard flip style. This how it will come to you. We have had some fun with the style to show you other options. 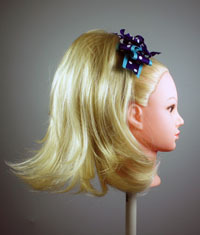 You can also reverse this hairpiece and it adds about 3 inches to the length. Left side aLot of teasing of her hair Right side- No more damage to her hair. Above demonstration is the flip style reversed then teased to style. New straight style color chart press here to view. After 10 yrs Flip is being discontinued 2018. We are not producing more. We have to remove less popular items to make room for the new styles. Always read our policy section before placing an order with us! See Youtube videos of this style. This style fits youth, tween-agers and teen/adults. Mannequins for display are smaller than a human head. Flip style is 12 inches long and has 2 flat combs and draw string with a locking stopper. Its very secure. Our pictures are professionally taken; however, everyone's monitor is different so we can not guarantee that the color you see is not slightly off. We do accept exchanges, however this is rare. Please see the color match help section in the menu for all options to help you match the correct color. Click any photo to enlarge: Photos represent color ONLY not always the style. Click on Links below color boxes to order. Below are the 14 inch Flip . The same style as 12 inch Flip just 2 inches longer. This order section reflects what colors we still have in stock to sell now. We will not be carrying this 14 inch anymore. Sale Items can not be exchanged, the sale is final. The color ring to order is the Original style ring.